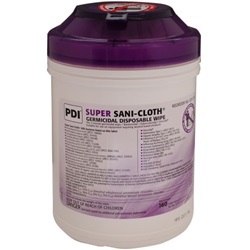 Sani-Cloth Super Disinfectant Wipes size large comes in a canister of 160 with purple top. 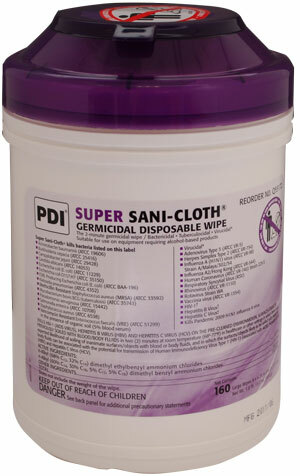 For use on surfaces and equipment such as stainless steel, formica, glass, carts, baskets, counters, cabinets and other hard non-porous surfaces. Tub dispensers’ unique deep well lid provides adequate space to store and access the next wipe. High Alcohol (55%). Bactericidal, tubercolocidal and virucidal. Manufactured by PDI.